The traditional fireplace has always been inefficient, smokey and messy, but often has too much charm to demolish. Take advantage of that wasted space by installing a Clean Air Standard Fireplace Insert and enjoy all the benefits of a slow combustion wood heater. Clean Air Standard Fireplace Inserts are ideal for use in the family home and, unlike open fireplaces, are designed for safe overnight burning. With the Firebox technology and heating capacity unique to Clean Air Wood Heaters, the Clean Air Standard Fireplace Insert has a sleek, contemporary design and is intended for homes of 350m2 squares of open plan living. 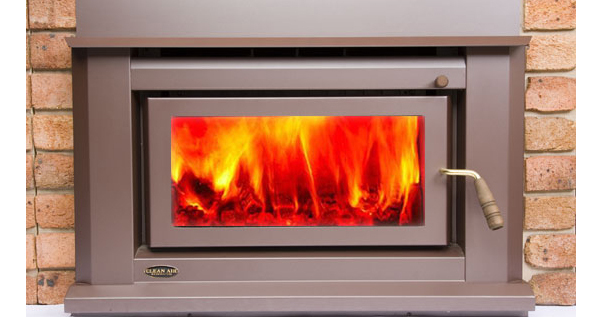 The outstanding performance of the Standard Fireplace Insert is typical of how Clean Air Woodheaters use advanced firebox technology and construction to provide longer burn times, lower emissions and a more even temperature through the day and overnight.